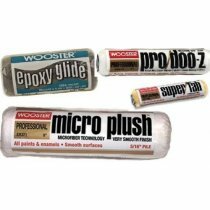 EPOXY ROLLER COVER WOOSTER R232 1/4" NAP The Wooster Brush Company has been manufacturing inn..
WOOSTER R235 9"/18" MICRO PLUSH 5/16" ROLLER COVER The Wooster Brush Company has been ..
WOOSTER RR642 18" PRO DOO-Z 3/8" NAP ROLLER COVER	The Wooster Brush Company has been manufac.. DYNAMIC 6" Mini Roller Frameis suitable for most mini roller covers. 12" Long Roller Frame for 6" Mi.. DYNAMIC High Density Mini Foam Roller Refills 6" 2PK - Premium Foam- ..
WOOSTER BR045 18" BIG BEN ROLLER FRAME	The Big Ben frame is designed for any 18" roller covers, s.. Dynamic 9" Deluxe Professional Extra Reach Cage FrameContractor-grade 5-wire cage with extra long re..
WOOSTER R207 MOHAIR BLEND 1/4" NAP ROLLER COVER The Wooster Brush Company has been manufactur..
WOOSTER RR666 PRO/DOO-Z FTP 3/8" NAP ROLLER COVER	The Wooster Brush Company has been manufacturing ..
ENCORE 1 QT MIX AND MEASURE PLUS RATIOS CONTAINER - 1 QUART (32 Oz)	Encore plastic containers..
9" Spiked Roller Plastic. 13/16" Plastic Spice with Handle- Made from rigid plastic s..